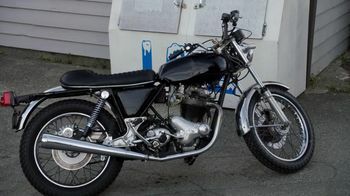 The Norton Commando motorcycle is used by Mr. Ketch as he follows Sam and Dean around America. Unbeknownst to the Winchesters, Mr. Ketch is tracking their movements, and taking it upon himself to "finish the job" and kill any and all monsters they come across, which the Winchesters do not kill. It is first noticed by Dean in 12.03 The Foundry, who gives it a comment of appreciation as he is walking to the Impala. Ketch uses the motorcycle to drive to the Morest Hotel alongside Dean and the Impala in 12.14 The Raid. Upon realizing that the Alpha Vampire is leading a vampiric incursion against the British Men of Letters, they drive to the compound in their respective vehicles. At the end of 12.18 The Memory Remains, Dean states his disappointment in having to report to Ketch, stating how he creeps him out and "drives the oldest, worst, most unreliable bike." After Ketch's temporary death, the motorcycle is kept in the Men of Letters Bunker garage. In 13.07 War of the Worlds, Ketch retrieves the motorcycle and uses it to come to the Winchesters rescue. After Dean tries to kill him again, Ketch flees on it. It is shown that the motorcycle was painted green at some point, possibly before Ketch confronted Dean at the Bunker in 12.22 Who We Are. This page was last edited on 16 March 2019, at 09:40.